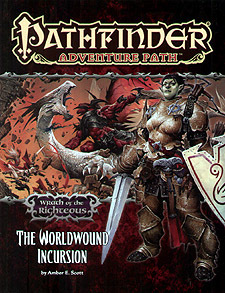 "The Worldwound Incursion," a Pathfinder RPG adventure for 1st-level characters, by Amber E Scott. A gazetteer of the crusader city of Kenabres on the border of the Worldwound, by Amber E Scott. The search for an infamous demon hunter in the Pathfinder's Journal, by Robin D Laws. A complete outline of the Wrath of the Rigtheous campaign. Four new monsters, by James Jacobs, Jason Nelson, David Schwartz, and Jerome Virnich.